An accompanying instrument used for an orchestra. The evening of classical music titled ‘Sharada Sangeeth Sanghitha’ which was recently held at the Elphinstone Theatre to mark the 25th Anniversary of the Sharada Kala Nikethanaya, was a rare occasion where multiple talents of diverse traditions converged in harmony to make auditory feat. It was the talented students of the Kala Nikethanaya and veteran musician Anil Mihiripenna who is also the founder of the Kala Nikethanaya (a school of music), who took the audience on an exploration of not only the diverse musical traditions such as Gazal and into the interior of the three palaces of Prince Siddhartha; Ramya, Suramya and Subha through an instrumental explanation but also into the fascinating facets of Kathak dance. Perhaps the most significant item of the concert was the Kathak dance performance by visiting Indian academic Prof.Mandavi Singh. The Kathak performance which mesmerised the audience, offered a glimpse of rich artistic legacy of India and a rare chance for Sri Lankan art-lovers of witnessing an authentic Kathak recital. The Concert commenced with Handavahini, a song composed in Sanskrit which was sung to the music score created by Anil Mihiripenna. Significant aspect of this music composition is the creation of the Ragic atmosphere though the composition is not based on a particular raga. 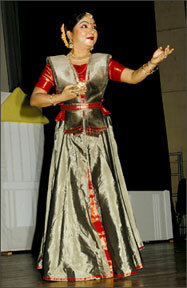 The next was the Kathak dance titled Navdurga Pradurbhava which was choreographed by Duleeka Wickramasinghe. Nruthiya Vandana (Bharata Natyam) choreographed by Weerasingham Wijendran was based on Radha-Krishna, the famous story of romance in India. It should be mentioned here that choreographer Weerasingham Wijendran is a talented dancer who had proved his mettle. One of the important items of the concert was the Gazal sung by Sujith Priyadarshana. Gazal is a song composed in Urdu language. Vocalist will find it extremely difficult to sing a Gazal if he or she does not posses a sound of knowledge of Urdu. Perhaps it would not have been a difficult task for Sujith who earned a MA from the ITS University in Kerala. Though it was a difficult tradition, Sujith was able to attract the attention of the audience. Kethaka Mahima (Orchestral) composed and trained by Saman Fernando expressed the joy and feeling of abundance associated with the harvesting festival. Being an agrarian society, harvesting is an importance occasion which is celebrated throughout the villages in Sri Lanka. This composition was entirely derived from traditional folk melodies. Group Song Khayal and Tarana by students of Sharada Kala Nikethanaya was an exposition of these styles of songs. The Khayal (Imagination) and Tarana is a composition without any wording. It primarily shows the ability of a singer or group of vocalists. Tarana consists of incoherent sounds which convey no meanings. The group of vocalists who took part in this group song was trained by Shantha Ramani Dias. This item showed the kind of rigorous practice that Sharada offered for its students which helped the students to achieve excellence. This item was followed by Udana, a special Tabla orchestra. It is rare that Tabla which is an accompanying instrument is used for an orchestral. It was especially composed for Tabla by Nandana Wijerama. 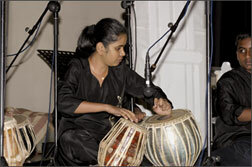 One of the salient features of Tabla Orchestra was the participation of women tablists. This was also one of the items that attracted the attention of the audience. Ramya (summer), Suramya (winter) and Shubha (Rainy season) was, perhaps, the most innovative piece of the concert which was composed by Anil Mihiripenna and conducted by Geeth Mihiripenna. This was instrumental explanation of the life in the three palaces that king Suddhodana built for his son Siddhartha. The king wanted to occupy his only son in the three palaces which were building for the three main seasons in India; the winter, summer and rainy seasons. It was the intention of the king that his son should always be happy without ever seeing the negative aspects of life. 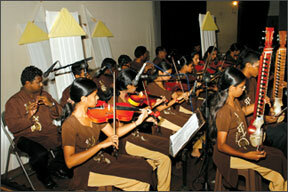 Enthralling spell of classical music. So he employed beautiful maidens who were accomplished Kathak dancers to please him. The music scores for this composition was made to reflect the inherent characteristic of kind of music performed during these seasons which acted as an anti-dote to ward off the negative aspects of the particular season. For Ramya, the music was composed to create the anti-summer atmosphere. Same principle is applied in composing music for Suramya (winter) and Shubha (rainy season). The most important item of the concert was the Kathak dance recital, especially prepared for the concert by Prof. Mandavi Singh who is one of the most famous Kathak proponents in India. A significant aspect of Kathak dance is its subtlety and the attention that it attracted to footwork. Kathak is deeply rooted in religious practice and was first performed to Vedic chants and subsequently to religious songs in prabhand style. Keertans and Dhrupads were incorporated into the dance in fifteenth century. Characteristically Kathak dance recital commences in a slow speed and progressed into the very fast speed towards the end of it. This recital by Prof. Mandavi was marked for its perfect Tukras, a piece of dance which lasted only for six or seven bars of the time scale. Perfect Tukras is a salient characteristic of an accomplished dancer. The hand behind the success story is none other than Anil Mihiripenna, a versatile musician who founded Sharada Kala Nikethanaya. Anil has marked his foots prints on the contemporary musical arena as a teacher of music and a creator. Among his outstanding creations of music score for ballet is illusion which is based on ragas Kiravani and Pilu.His compositions outside the Hindustani system of music such as The daughters of Mara, Puja and Deep Thought amply demonstrate Anil Mihirippena’s unique creativity and sharp insight into the subtleties of sounds. Perhaps, his most famous music score which brought him universal admiration is Peacock Dance which was created out of behavioral patterns of the peacock and translating them into sounds. For this score he has used the orchestral music as the basis. It was performed by the Nebraska Symphony Orchestra in 1980 and 1997. One of the significant aspects of Mihiripenna’s compositions is the assimilation of western instruments and techniques such as Counterpoint and harmony to enhance his creativity. This aspect could also been seen in Ramya, Suramya and Shubha. All in the entire concert offered rare pieces of Hindustani classical music for Sri Lankan audience apart from celebrating the 25th anniversary of the Sharada Kala Nikethanaya. The concert showed that if chances were given, Sri Lankan students could excel in aesthetic pursuits and are second to none in terms of their performances.